This is Google’s Echo Show competitor, the Home Hub. We knew it was coming, via an avalanche of leaks and now, moments before the event has officially kicked off, here it is in all of its glory by way of the full leaked product video (again spotted by 9 to 5 Google). The product is a looker — especially compared to the last two generations of Amazon’s Echo Show. Google says the product was also purposefully made smaller in order to better fit in the home. Size wise, the device seems to split the difference between the Show and Spot. The product also features ambient light and white balance sensors to adjust to its environment. It will also shut the display off at night, when it’s time to go to bed. The device joins a trio of “Smart Displays” for Google Assistant built by JBL, Lenovo and LG. Design-wise Lenovo’s was the best of the bunch, but the Home Hub looks to have outclassed it. The functions pretty much what you’d expect from these devices, including traffic, weather and cooking. The Hub features a number of recipes built in, offering you step by step directions, along with quick videos show you how to execute different actions like poaching eggs. Of course, Google’s got one key, not so secret weapon against Amazon: YouTube. Unlike Amazon, which relies on a browser-based workaround, hub plays videos automatically from Google’s service. 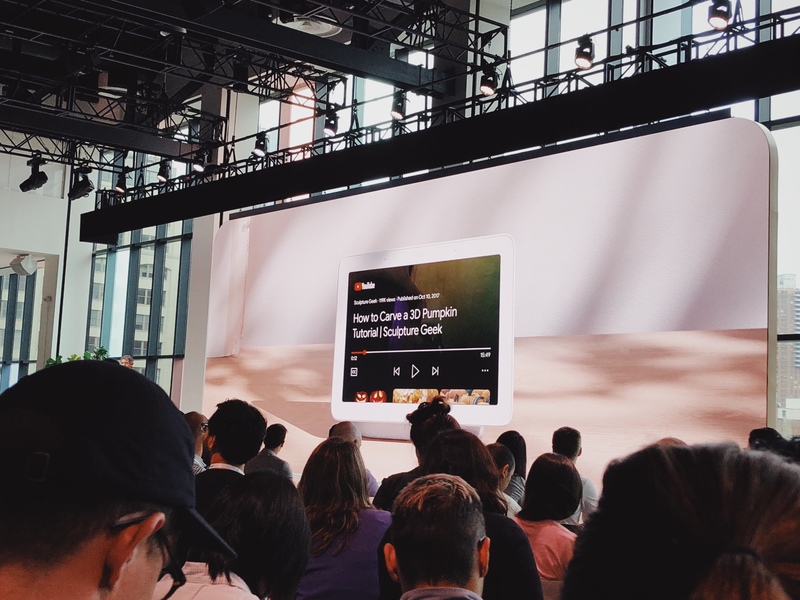 That also goes for YouTube Music, making the device the first killer platform for the service, playing music and showing videos. Fittingly, the device will ship with six free months of YouTube Premium. 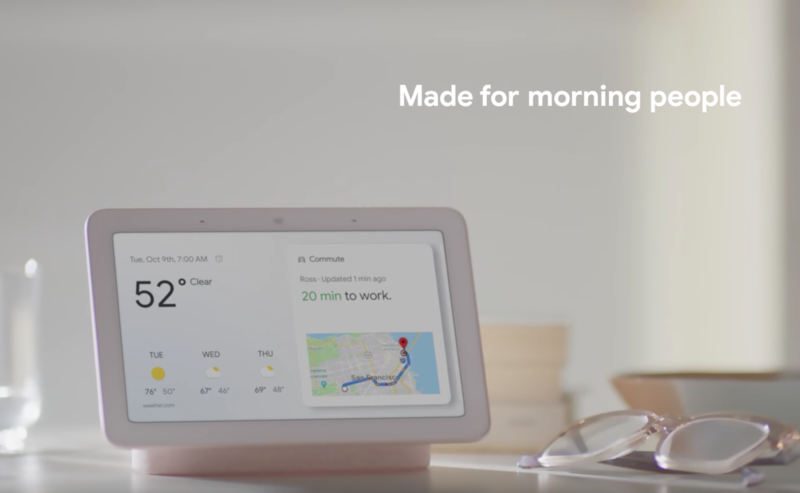 Google has also clearly made fitness a key piece here, showing off some yoga classes on the product, along with a touchscreen smart home control center. “It truly is the hub for a thoughtful home,” the company said during the event. Home View is the name of the device’s dashboard, which allows you view different smart home products by different rooms. It’s essentially a one stop shop for Nest and various other smart home products. It looks to be leaps and bounds beyond what Amazon currently offers with the Echo Show. Naturally, the product will also bring video from Nest cameras to the product. The list of compatible products includes devices from Dish and Philips.